Dr. Ahmed trained and practiced general surgery in Connolly Hospital, an affiliate of the Royal College of Surgeons, Ireland. He attained the Fellowship of the Royal College of Surgeons in Ireland in 1995. He received his Diploma in Laparoscopic Surgery from European Institute of Telesurgery, Strasbourg, France (2000). 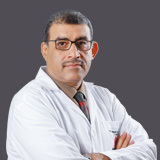 Dr. Ahmed worked as a Surgical Lecturer in Royal College of Surgeons, Ireland (1998 - 2000), and as a Consultant General Surgeon in various hospitals such as Erne Hospital, Craigavon Area Hospital in North Ireland and Boomfield, Frenchay Hospital, and South Tyneside Hospital in the United Kingdom (2000 – 2012). Dr. Ahmed has a special interest in general gastrointestinal disease including Anorectal conditions, upper and lower GI Endoscopy, laparoscopic cholecystectomy, all hernia repairs and breast and thyroid surgery. Dr. Ahmed is a fellow of the Royal College of Surgeons, Ireland (1995), and a member of The European Association of Endoscopic Surgeons (EAES). As well as the European Institute of Telesurgery (EITS). Dr. Ahmed speaks Arabic and English. • Member of the European Institute of Telesurgery (EITS).